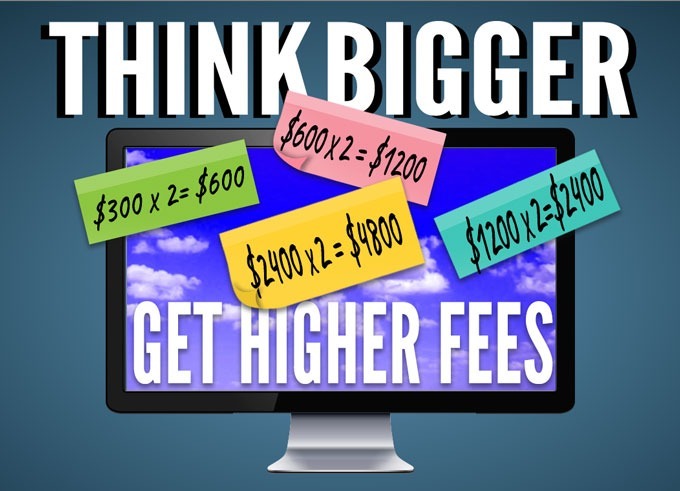 Are you ready to think bigger to get higher fees? I run into this all the time. Artists and other creatives are focused on their art, their music, their writing, etc. That focus keeps them thinking inwards. That keeps them focused on the day to day and most often the logistics and the minute details. Many artists are not in the habit of thinking BIG especially when it comes to thinking bigger to get higher fees. When it comes to negotiating gigs, I’ve found that so many musicians and performing artists willingly negotiate themselves into comfortably smaller fees. How about going for it and asking for what you really deserve based on the value you offer? When it comes to planning projects, do you plan based on what you think you can afford? Do you create small budgets rather than truly going for your heart’s desire? Let’s begin to turn this around. The best way I know to do this is to think bigger to get higher fees and project budgets. Let those crazy, never attempted goals, take root. It is time to make some plans based on the really BIG ideas. Then let’s find a way to make them happen. If you never focus on those BIG ideas, then you’ll never know what you might be capable of accomplishing, will you? Rather than scraping together tiny bits of money to make a project happen, why not plan for the BIG budget and then figure out how to get the funds to do it. Do BIG numbers scare you? Are you afraid to ask for four times the fees you are getting? What’s the worst that can happen? They could say “NO.” Big deal! They could also say “yes,” and won’t you be surprised. They could also say “NO” to your small fee. So again, what have you got to lose? Now you do have to offer value. BUT, when all things are in alignment, even then, many artists will undersell themselves. How about you? This week: Practice by doing some BIG-Thinking Exercises. Write down the fee you usually charge for one of your typical gigs. Now double it. Now say that number out loud. Is it hard to imagine yourself getting that fee? Keep saying it until it is easy to say and feels more natural. It might take a while. Put sticky notes around your house or in the touring vehicle with that number and keep saying it out loud. Do this for at least a week until it feels comfortable. Then use that number on the next gig negotiation. Just state that fee with confidence. Then try doubling that fee again. Repeat this process until you reach a wonderful fee that is way bigger than you imagined. Live in the satisfaction that you deserve that fee. You will find clients, presenters, buyers who are happy to pay it. 2.Take a current project you are working on or hope to work on. How you can make it bigger? Do some, “What if?” type of thinking and get out of your comfort zone. What if I got a sponsor? What if I created a great crowdfunding campaign? What if I hired the producer I really wanted? What if I got some super-fan involved to help explode this project? These things are possible, they just take some belief from you that they are possible. Start planning to make them happen. It just needs to start with some BIGGER thinking. You can do it! How are you going to think bigger to get higher fees? What are you working on right now that you might take to a whole new level by thinking bigger? Leave me a comment on the blog for this post. don’t forget to sign up for Biz Booster Hot Tips or subscribe to this blog. Thanks, Jeri! Spot on, as always! Cheers from your friends in Michigan!